Based on a Motorola Defy smartphone, this "ultimate wrist watch" has a custom-written app to light up with the right information whenever the wearer orients the watch in time-telling position. The really cool feature of this app turning the screen on automatically when you look at the watch and turning it back off when your done. You should need to fumble around with the power button to check the time. This is accomplished my monitoring the acclerometer. When the phone is at the write angle it turns on (the angle and threshold is adjustable). Monitoring the acclerometer requires acquiring a partial wake lock. This of course will decrease your phone's battery life, but that's the price you pay for the ultimate watch. 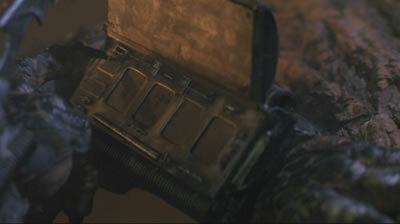 To help save the battery, the app will release the wake lock if it detects no movement for a long period (like an hour). Turning the screen on restarts the service. 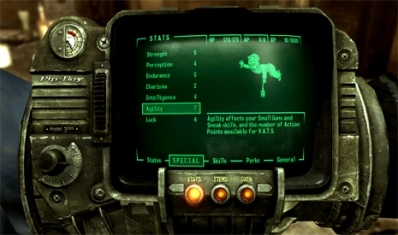 And, of course, as the title of the article suggests, fans of the Fallout game series might be reminded of the RobCo Pip-Boy 3000. From the Ultimate labs via Hack-a-day.